If people ask me to describe the setting of Violet Evergarden, I can confidently say it is World War 1 except it’s set in a continent that resembles Australia and there’s yakisoba in Victorian England with a German-sounding names for towns. The picture is the reaction I expect from people. This episode adapts the first volume’s chapter four and, much like previous episodes, it recontextualizes the drama to fit Violet’s “new” character in the story. Pretty much the first half is anime original, setting up the war and the tone of the episode. In the novel, we start immediately in the war with little context. Both approaches work well and usually the anime likes to do the latter as soon as possible, letting the protagonist of that particular chapter tell the story. But Violet’s different now. She knows what war actually does. This chapter is reinterpreted as Violet’s first real exposure to the cruelties of war. Her sullen reaction to injured soldiers and the timid soldiers who refuse to cooperate with her sets in while she begins to comprehend the horrors of the war. We also see the reluctance Hodgins displays too with this particular job. Violet could only do the job if she stole the offer and sneaked out to do so. That’s not something you find in the novels at all. While the battle in the novel feels like any typical war, the anime’s episode seems to be inspired by World War 1’s Russian battles. These soldiers don’t just don typical Russian soldier outfits, but they also are as unprepared and weak as these real counterparts. It’s a war they don’t understand why they are fighting. When we finally get to the protagonist of the chapter, the anime begins to be very quiet as if taking cues from All Quiet on the Western Front. When the shooting happens, it isn’t at all action-packed. Snipers shooting people from far away have nothing romantic about it. It’s dull and frightening. This scene really captures the sentiment of wars as experiences no one wants to have and I think it’s quite effective. Until Violet comes in anyway by jumping off a plane and going Shiki on the enemy soldiers. The novel’s a bit more ridiculous on that front. Violet appears by surfing on an axe. We actually can see this in the first commercial for the novels and there’s an illustration of it too. In the novels, the protagonist of the chapter describes her as some angel of death. It’s one of the more ridiculous scenes, making the folks who read the Violet Evergarden novel fan translation believe it’s some light novel trope or cliche. 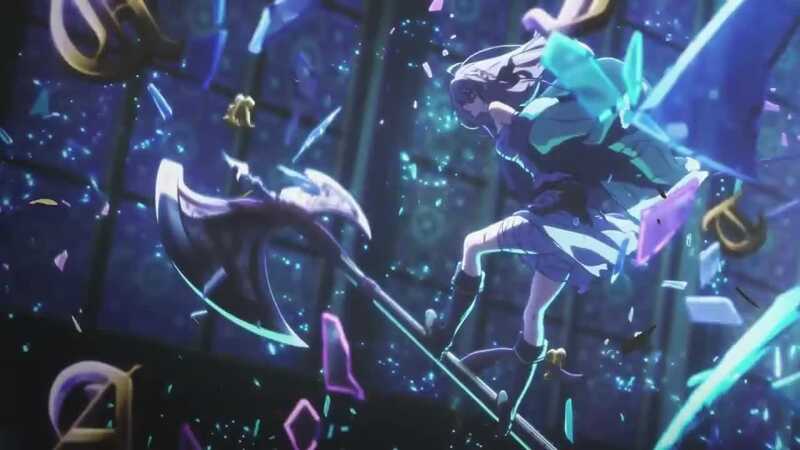 Nah, I personally wish more scenes had axes. The ridiculousness in Evergarden is always authored by Akatsuki who doesn’t understand what a general tone for the book is. In fact, the novels glorify war. The author actually admits she wanted to write a war story in her author blurb and the afterword and end it as a story about love or something. There is really no concrete stance Akatsuki has over war. So it’s great that the show has some sense not to do that. With a premise like Evergarden, it should be staunchly anti-war and anti-military. Violet is a military veteran and she is trying to find the meaning of love. It is a bit ridiculous that war becomes the central theme for such a story. That said, the anime can’t really take Violet’s badassery out of this episode. Even though they toned it down — primarily not giving her an axe — it breaks the bloody realism the first half of the episode has given us and reminds us Violet is actually a superhero with superhuman strengths. She is “nerfed” from the novels which actually depict her as a warrior goddess, but she sometimes clashes with the anti-war tone of the show. I think that’s a situation that can’t be helped. Throughout the episode, the protagonist of the chapter mentions “Maria”. This narrative beat hasn’t changed much from the novels except for the setting (it’s indoors instead of outdoors — minor tidbits like that) and Violet air-types for some reason. Even when Violet goes to meet Maria and his parents, nothing has changed. But in the novels, her cool demeanor is somewhat lessened because she is thinking about her role in the war. It’s foreshadowing her experience with Gilbert. We already know that in the anime. 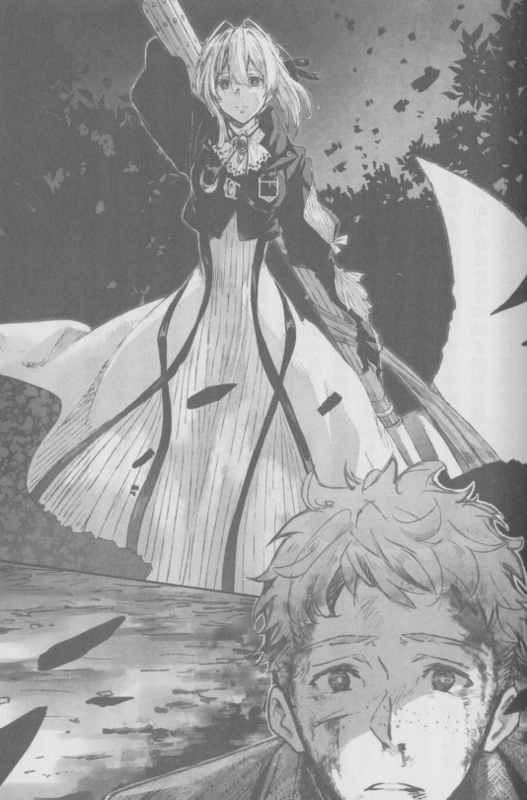 Thus the scene is reinterpreted as Violet experiencing emotions of grief and regret for the first time again. This episode certainly works to show how far Violet has gone. I don’t think it’s great though; the previous episode is certainly the best in Evergarden and I never thought it’d be as good. However, I feel like this episode is just fine as a side story kind of thing. I am curious if the final arc will be a bunch of side stories not too connected with the main plot. Since the audience is more like parents overseeing Violet’s growth, it might be interesting to see her go off and be an adult for once. But there’s three episodes left, so who knows if people’s patience will wear off. Since the anime now feels like adapting stuff, we can reasonably speculate what’s left to adapt. There is one more chapter that needs to be adapted if the show wants to adapt all of volume one. I hope they don’t adapt that one. They didn’t even show it in the commercial anyway. I’m also not a huge fan of volume two as well, but there is a chapter dealing a bit with Benedict — the blonde haired guy with really bad fashion taste in the post office. Since he’s in the anime, I expect that chapter to be adapted. It works well with Violet’s growth too. There’s also a good possibility that the anime could go the anime original route again. The structure for Evergarden is rather unusual and it reminds me of the original Super Dimensional Fortress Macross where the anime’s actual plot ends 20 episodes in but there’s 10 more episodes that serves as an “epilogue arc”. I like the idea of the epilogue since it deals with the aftermath of what usually happens in the story. It does get tiring though. If the anime wants to go there, it could use some anime original episodes to back up that kind of structure. Whatever it is, I’m looking forward to the show’s resolution soon. It should be quite interesting to watch. So that’s the story of the axe in the commercial. At the time it looked very weird – a single fantasy aspect in otherwise realistic approach. Glad it got cut. But what’s the baseline of the quality of light novels if as flawed as it is, Violet Evergarden was thought to be great enough to win the contest and get the adaptation? Let’s make things clear first: The KA Esuma contest pretty much awarded the novel the grand prize for having competent writing and exploring themes the contest judges really like. That’s usually how contests in other publishers work, but there seems to be many really low quality submissions for KA Esuma’s. Since the publisher hasn’t really established a repute — one of the probably intended goals for Violet Evergarden’s adaptation is to make KA Esuma gain some recognition — writers don’t know too much about it, so they haven’t tried it. Most of the writers submitting to KA Esuma are fans of the studio or know about their great work. This doesn’t mean that future grand prize winners will not be better than Evergarden, but the benchmark is quite quite low. Thanks for the very informative answer! That makes sense. I just remembered that KyoAni chose to adapt Musaigen no Phantom World also based on the results of the contest, so that speaks a lot about the general quality. Hopefully with the recognition of Violet Evergarden things will improve. Yeah, Violet Evergarden does feel a lot different form what the general public believes light novels to be. I guess diversity is always a good thing in any medium. It’s honestly not that different from mainstream fantasy/SF novels. I wouldn’t even say it adds to the diversity of light novels, which is already bigger than many light novel experts can imagine. It just feels “different” if you never are exposed to the literature out there. KA Esuma in general actually feels like this, with Violet Evergarden in the extreme. Their published works are nothing like other works and that’s why I think there’s potential out there. But it’s too new, too small, and more importantly too inexperienced to do anything major now. It’s a unique project, but I’d rather see KyoAni expend their effort on adapting more established works than try their hands on the light novel market for now. Well, my knowledge about light novel (and Japanese literature in general) industry is very meager. 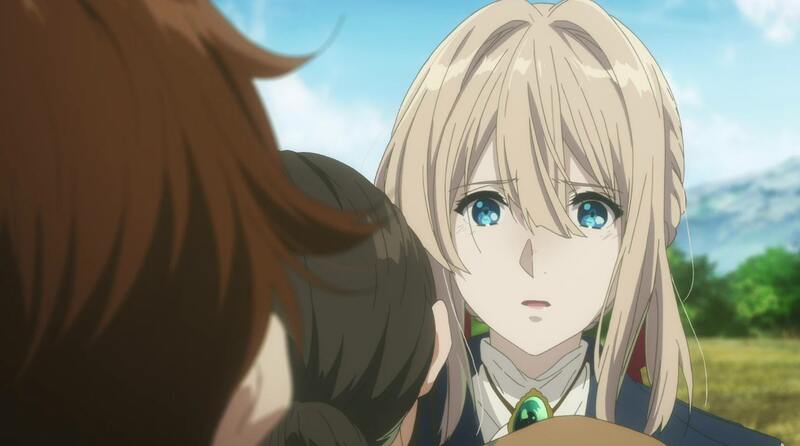 From the perspective of someone who gets exposed mainly to the mainstream stuff, Violet Evergarden seems to distinguish itself, but that may also be due to the anime production values. I think every opportunity to encourage creativity is commendable and while KyoAni may be better off choosing something tried and tested, trying to find new authors with potential should pay off in the long run.